I come from a competitive soccer family. I didn’t play, but my weekends were spent cheering from the sidelines. As an adult soccer is always on during tournaments. My husband became a fan about a decade ago, so now it’s a great excuse to host friends and family, gathered around the TV cheering on our favorite teams with great food and an ice-cold drink. 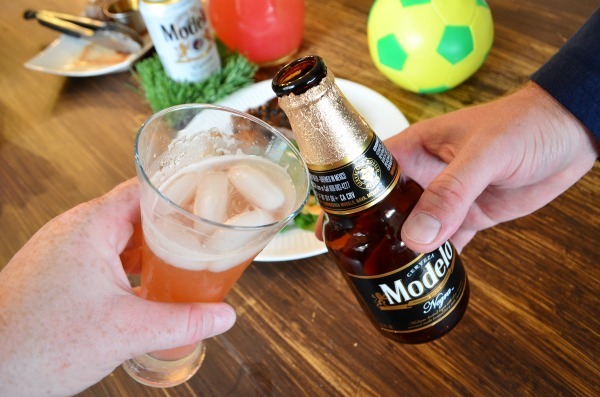 With Modelo as the Proud Sponsor of the 2017 Beautiful Game what better way to toast to your team and enjoy a summer of fun. To kickoff the summer and a season of watching our favorite sport I kicked up a special dinner. 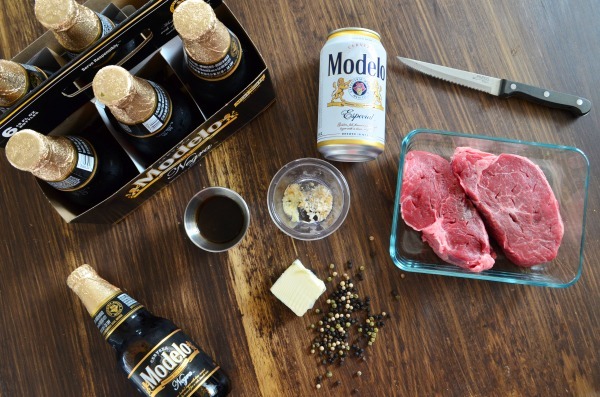 Summer, grilling, and a cold beer just go together so deliciously. 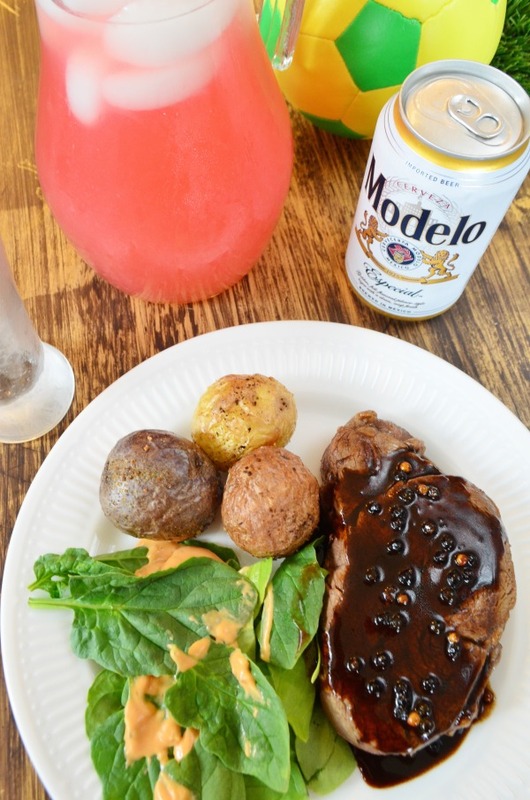 This steak recipe is infused with a rich smooth Modelo Negra paired with a peppercorn glaze and served with a refreshing and crisp Modelo Especial Raspberry Shandy. Place steaks in glass baking dish. 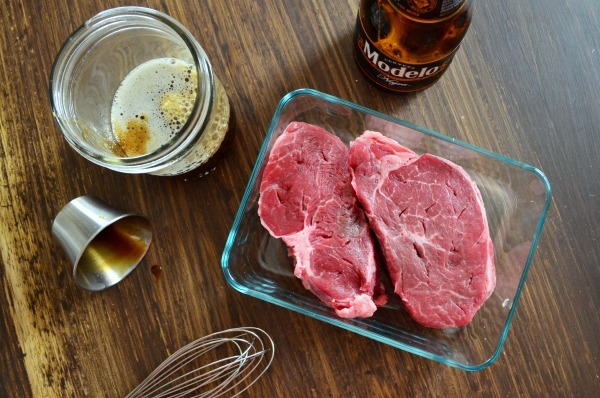 Whisk together beer, garlic, onion, and Worcestershire sauce. Cut small slits into the top and bottom of each steak. Pour the beer infusion over the steaks. Place to the side to marinate while you prep the fresh lemonade (raspberry puree and lemonade) for the Shandy and bring a frying pan to temperature. 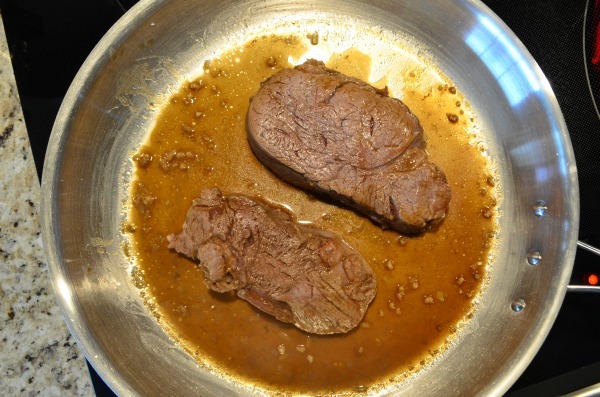 Remove each steak from the dish and place in a butter prepped frying pan. Sear each side for 3-5 minutes to seal in the flavor. Carefully spoon 4-5 tablespoons of the infusion into the bottom of the pan. Let the steaks simmer on the stove top until all sides are brown. Transfer to an oil coated stoneware frying pan, and finish in a warm oven (425°) until desired temperature. In the frying pan, add the butter, peppercorn, and beef broth. On low, simmer the mixture, making sure to loosen all the baked on bits. Reduce the sauce to about half before adding a pinch of cornstarch. Continue heating until sauce thickens to a glaze. Let the glaze sit and burn off the alcohol. 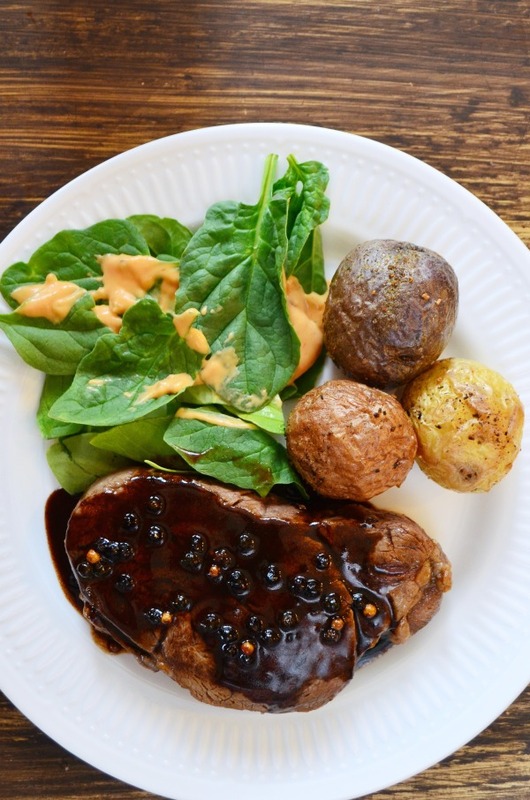 You’ll be left with an earthy and bold peppercorn glaze. Remove the steaks from the oven, transfer to a serving plate and cover with foil to rest while you mix up a delicious shandy. 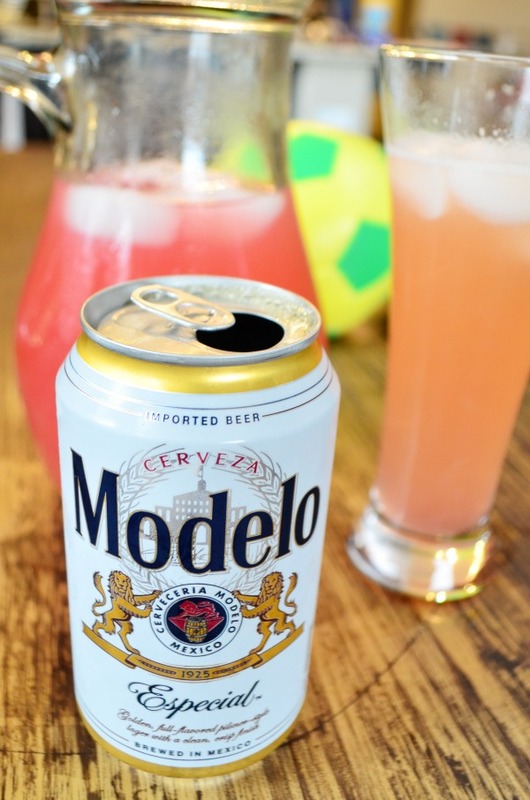 The crisp and fruity orange blossom honey aroma of Modelo Especial, with a hint of herb, is a great refreshment and pairs beautifully with a fresh raspberry infused lemonade. 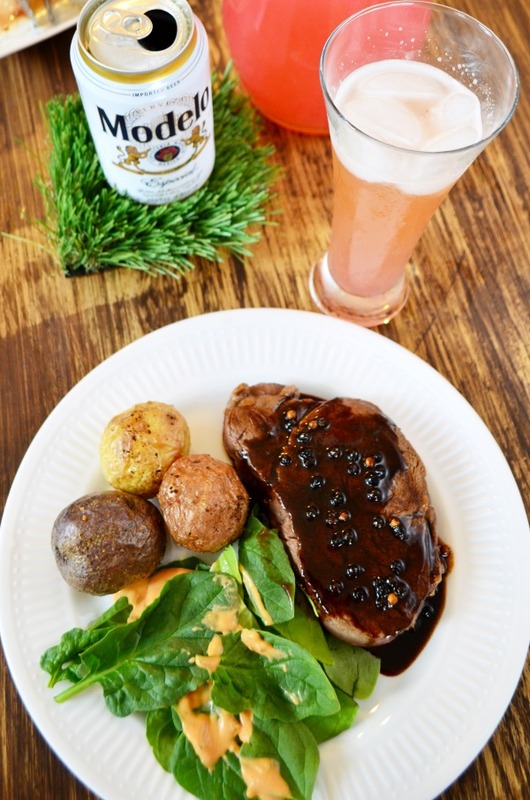 I served up this Shandy (1/2 beer, 1/2 lemonade) alongside the beer infused steak, peppercorn glaze, and crispy herb potatoes for the ultimate meal for an exciting match viewing with family and friends. Be on the lookout at stores for their special summer packaging. The Model Especial is brewed with a fighting spirit, perfect for powering a summer of camaraderie.